@Bill_Leach Thank you so much for sharing these files, Once I have my scaling issues sorted out I hope to contribute back to this amazing community. I’m Currently downloading Inkscape as I’ve seen a few YouTube videos about “outline” mode and setting your pen width to 0. It’s the least I could do, I have learned so much from this community and there is so much more to learn that I would feel guilty if I didn’t contribute at least once in a while and besides, IT’S ABOUT GUITARS MAN! Bill, When CNC’ing out the Strat neck and body files you posted, should both be cut out on path? Or should one be an inside cut and the other an outside? I made the neck file just a hair big so you will need to do some sanding on the heal for a nice tight fit. @ChristopherLathan thanks for converting the template you may want to add a center line for the bridge reference. I couldn’t find a drawing with hard tail locations for my Strat. I will do that as soon as i get home. I have layouts for the hipshot fixed bridge is could add. Scale line is 7.125" from the neck heel. Center line should be like 6.883 or thereabouts, wherever the center of the neck pocket falls. 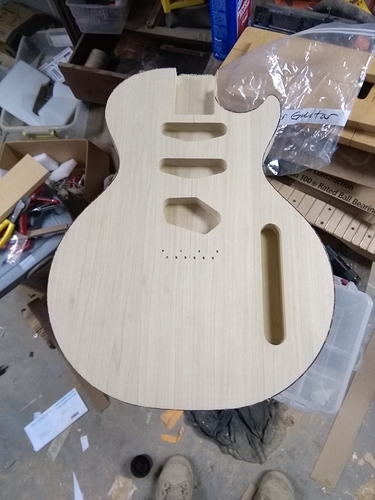 Outside the lines for template and body/neck. Inside the lines obviously for pocketing on anything inside the body like PU and control cavity routes. 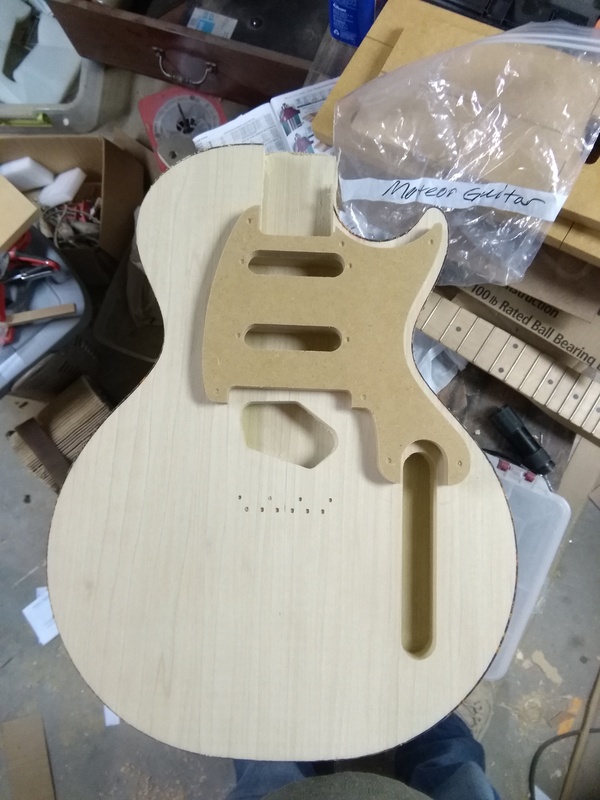 I think I nailed my scaling issues this week and have nearly finished a set of routing templates for a Les Paul JR (double cut), I’ll edit this post when I get home from work and attach the Easel files. Please note all holes are 4mm so I can use a 4mm brad point drill bit to mark them on the working templates which is going to be 18mm MDF. 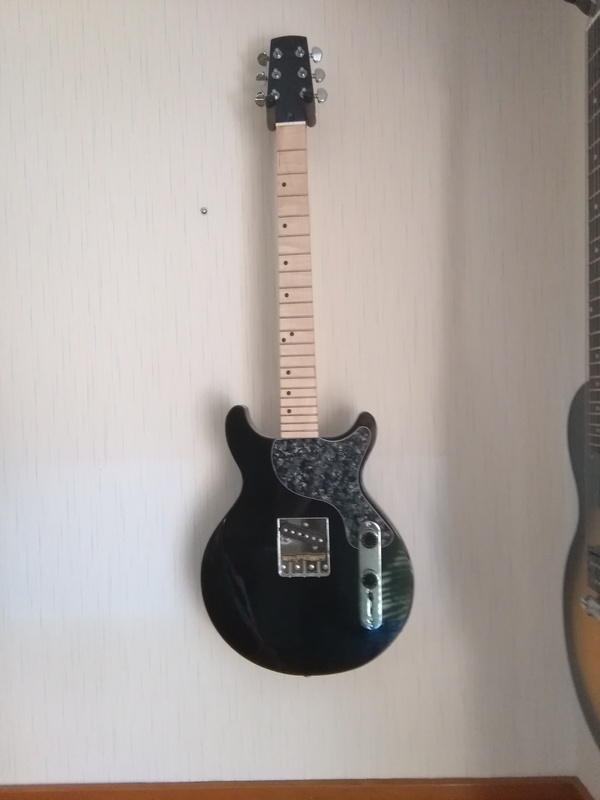 I’ve been wanting a Junior for a while now and figured my Ideal one is way out of my price range and i refuse to sell any of my other guitars . So why not try and build one? , I’m also trying to work on a single cut variant too. Man, that is sweeeet! I too have been thinkin a bout making me a DC! Awesome idea with the Tele hybrid thing, love it! @DeanWood thanks for goin after the DC templates, I am going to build one for sure! I have files for the single-cut, but a bolt-on neck version that I’ve converter to a Nashville tele hybrid . Here is a copy of my routing templates for a Single Cut LP JR. It is based on a 1950’s model hence the “step” on the neck pocket. I’ve also piled them onto one “sheet” so you can separate them as needed.